Is your child in an unsafe booster seat? Do you own any of these products? Does your child ride on a Harmony Big Boost Deluxe Booster car seat? About 150,000 of them have been recalled. The government says in a crash the seat belt "may cause excessive force to the child's chest." They were sold at Walmart, Amazon, and other places. If you have one, stop using it and contact the company. More than 170,000 Universal Rechargeable Power Banks for phones and tablets could be a fire hazard. They've been recalled because of three reports of overheating including one causing a house fire. They were sold at Burlington, Kohls, and Ross. If you have one, stop using it and get a full refund. Click here for more on this recall. 1,900 Salsa Warbird and Vaya bikes were recalled after two reports of forks breaking leading to one minor injury. They're sold at REI and online. Bring the bike back to the place of purchase and get a replacement part. 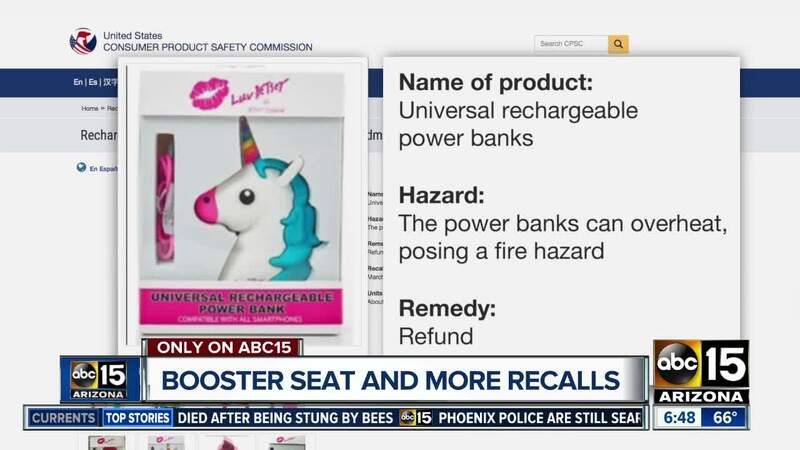 Check for all government recalls here.